My lord, members of the jury, the great Internet public, we are gathered here today to put Gilbert Adair on trial for several counts of high treason, attempted intellectual murder, constantly beating his few funny jokes to death, being generally mean-spirited, and above all, this court is to determine a legal precedent: whether Adair’s book The Act of Roger Murgatroyd should be considered a crime in itself. To determine this, it is best to review the evidence. 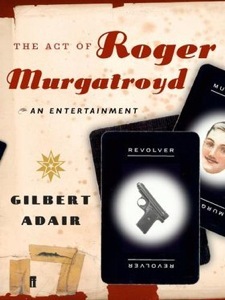 The Act of Roger Murgatroyd was marketed as a hilarious send-up of Agatha Christie and her contemporaries. It contains a locked-room puzzle, when Raymond Gentry, a foul-mouthed gossip columnist, is shot to death inside a locked room, with the door locked, the windows barred, etc. This all takes place at the snowed-in country house of Colonel and Mrs. ffoulkes, who send for a retired Scotland Yard man to help solve the crime. Unluckily for everyone present, Evadne Mount is also at the gathering, and she proceeds to play the role of amateur sleuth. The sharp-eyed reader will observe that Mount is meant to be a parody of Agatha Christie and (perhaps) Christie’s own creation of Mrs. Oliver: an outspoken, eccentric detective story writer who is thrilled at the chance to play detective in real life. (Adair constantly stresses how real this life is, in one of the book’s weakest running gags.) Unfortunately, where Mrs. Oliver was a delightful caricature through which Christie voiced her opinions on mystery writing, Evadne Mount is an annoying cardboard cut-out of a figure (though that may be insulting to a useful packaging material), with a loud voice, a habit of talking in circles until you forget what the bloody point is, and a bloated opinion of herself. She shares Mr. Adair’s attitude through the entire novel, a smirking “Tee-hee! Aren’t I so clever?” sort of attitude that makes you want to reach in and slap the author silly until he shuts up and gets to the point. This forms the superficial layer of satire of the novel, which is so mean-spirited that it’s led to interesting speculations from Dr. Sigmund Von Hornswiggle that an Agatha Christie novel murdered Adair’s family when he was young. Adair follows in the tradition of George Baxt’s The Affair at Royalties, completely misunderstanding everything about Christie but trying to pass himself off as the ultimate authority. He drops Christie’s name quite often, and readers are supposed to be delighted at this “subtle” touch that shows Agatha Christie and Evadne Mount are rivals. However, this is a lazy gag that instead winds up being infuriating, particularly when Adair demonstrates time and time again his ignorance of and condescending attitude towards Agatha Christie. He treats her as a “cozy” author who was only interested in clichéd plots too ingenious for their own sake— which is total slander. Christie, as we all know, has been able to triumph again and again. She practically invented what would become the modern slasher genre with And Then There Were None, coming up with complex psychological portraits of ten criminals who have beaten the legal system. Sometimes, as in The Hollow, her mystery can be very weak, but compelling characterisation elevates the book to a whole new level. In fact, much of what has now become cliché is due to Agatha Christie’s brilliant spins on these devices, which spawned derivative carbon copy after copy from second-rate hacks. To call Mr. Adair one of these would be far too harsh to those who worked hard to earn such a title. I don’t have to spell it out, do I? I know what havoc this kind of mutual suspicion can cause. It was the theme of my first novel, The Mystery of the Green Penguin, you remember, in which a woman becomes so obsessed with the idea that her next-door neighbour is slowly poisoning her crippled husband, that her own husband, driven to distraction by her compulsive spying and snooping and sleuthing, eventually runs amok, and splits her head open with a piece of antique Benares brassware. And, of course, the neighbour turns out to be totally innocent. Now, I’m not suggesting anything like that is liable to happen here. While the reference to the “green Penguin” is almost amusing, Evadne Mount elaborates about her book far too much—there is no longer any fun in speculating what kind of mystery would be involved. In fact, the title now sounds absolutely stupid, because the “green Penguin” has absolutely no relation to the mystery Adair describes! Not only that, this, like the rest of the book, is absolutely nothing like anything Christie ever wrote!!! Ah, but have you forgotten that I rewrote it? With calamitous results! It was my very first play, Oedipus vs. Rex, and what I tried to do was retell the myth as a conventional courtroom drama. The defending counsel was Tiresias, the sightless seer – I was thinking of Max Carrados, you know, Ernest Bramah’s blind detective? No? Anyway, it was he who proved, solely by the powers of his deduction, that “the Oedipus case”, as it was referred to throughout the play, was in reality a travesty of justice. The climactic twist, you see, was that Oedipus had been framed by his political enemies, who hadn’t just spread the rumour that Jocasta was his mother but had themselves killed Laius, his alleged father. Then they substituted some hapless double to be murdered by Oedipus when they met each other at the crossroads of Daulis and Delphi. Well, what a dud, what a stinkeroony, what a pile of horse manure! The whole thing was done in masks and, if I’d had any sense, I’d have worn a mask myself! Believe it or not, the joke is not even close to being done. There is still a considerable block of text building up to an appalling pun involving an actor’s name, which makes the “Charlie Chan Chanthology” look like a masterly piece of wit by comparison. This demonstrates a truly painful tendency of Adair’s to go on and on and on, beating what started as an amusing joke into the ground to the point where you wish to strangle him. And if he stopped to think of it, the story he came up with for the excellent title Oedipus vs. Rex is entirely stupid, which would require the so-called “political enemies” to have the gift of clairvoyance! For not only do they know that Oedipus will meet the substitute, they already know he will answer the Sphinx’s riddle and become King and consequently, a political enemy! A similar pattern is established for the remainder of Evadne Mount’s fictional novels. Sometimes the titles are amusing, but she insists on telling the entire plot whether asked to or not, and consequently, she hands-down wins the title of Most Annoying Character (though the others put up quite a fight, believe me!). Another mistake Adair makes is name-dropping. It is possibly the single most annoying habit in any comedy, and I’m positive when I say, my Lord Sir Henry Merrivale, that absolutely anyone can write such a “joke”— it takes no effort at all and consequently, it almost always gets no laughs. “I leave locked rooms to John Dickson Carr!” Evadne Mount clumsily declares. Carr is referenced a few times, but every time is an absolute embarrassment. Near the very end, she goes on and lists a huge list of mystery authors, in an apparent attempt to appeal to genuine mystery fans. Here’s the problem: the book is set in a time when several of these authors weren’t as famous as it is insinuated! Not only that, Mount pretends she’s part of The Detection Club and takes the credit for creating “Mayhem Parva” one evening with her fellow members… although this is set in the 1930s and the term was coined years later by Colin Watson!!! A simple trip to Wikipedia would inform Adair of this; in fact, Adair comes dangerously close to lecturing on John Dickson Carr’s locked-room lecture in The Three Coffins. But Wikipedia only tells you that it exists; it doesn’t contain the full text. So Gilbert bails out, reminding readers of happier days when Anthony Boucher in Nine Times Nine or Clayton Rawson in Death From a Top Hat were able to add their own unique spin to the famous locked-room lecture. So the satire is unfunny, inaccurate, and mean-spirited, a combination that will never result in success. So how is the plotting? There again, Adair drives readers insane— his locked room murder has the stupidest answer I’ve ever come across, with a gaping plot hole so huge that you can drive the entire plot (and an elephant) through it. The book itself is shoddily constructed. There’s no real detective work, the suspects simply scream out their guilty secrets, sob a bit about how much they regret such-and-such, insist that they did not kill the victim (but how they wish they had! ), and they take forever doing so!!! While the idea for the twist ending is genuinely interesting, Adair is the wrong person for the job. The idea should’ve been written by someone who actually appreciates Agatha Christie— Robert Barnard comes to mind. It’s true, I’ve only read his appreciation of Agatha Christie, but it’s a very good book which makes Barnard seem like the right man for the job. Cook: You know, I think it’s a shame, how we’re treated as social inferiors by the aristocratic class that is taking advantage of us. Butler: Certainly, you have a point. Do you notice how nobody even knows your name, but they call you “Cook”? Quite shocking, really, that we can treat fellow human beings in such a way. 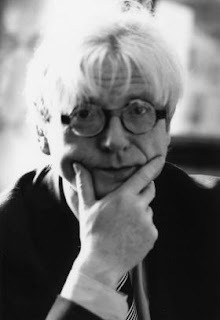 Cook: Of course, there’s no way out of this division of classes perpetuated by snobbery, is there? Butler: None that I can see. More tea? To sum up, ladies and gentlemen of the jury, The Act of Roger Murgatroyd is an abomination on the mystery landscape. I listened to an audiobook and haven’t got access to a physical copy, which turned out to be a disadavantage—I could not throw the book against the wall, nor could I burn it, destroy it, or eat it. Oh, for the love of pudding (pardon the vulgarity)! (Damn! I’m sinking to this book’s level!!!) If you own a copy of this book, please contact your local exorcist as soon as possible. The topper to this review is that last picture caption--now, that's hilarious. You should read Barnard--he has a lot of fun with the conventions, but he also respects them, as you know, and he knows how to plot! Reading your review, I want more than ever to compile a post about detective stories people might want to avoid, but I want to write it without restraints and self-censorship – since I have a somewhat dark, twisted sense of humor and that's not something appreciated by everyone. It would just be a very mean-spirited piece. Here, I think some historical context is in order. Often, self-styled "serious" writers would cruelly mock and caricature authors whom they deemed "frivolous." 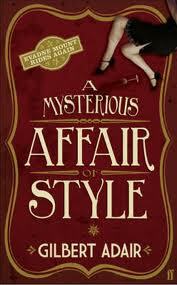 Hence, stereotypes about Agatha Christie, other mystery writers, J.R.R. Tolkien, and other science fiction/fantasy authors abounded, even though the cartoonish smears had little semblance to reality. The image of Christie as a blathering old hen circulates a lot, despite its distance from the true woman. Wonderfully put-- if only Adair had read your article before starting on this venom-filled drivel. I really, really hate this book-- at least as much as, if not more than, "The Affair at Royalties"... and if you've seen the video I shot for that book, you'll know how much it ticked me off! Such an article would be appreciated for its content, but I do think you have a point that it might run into mean-spiritedness. I still take swipes at "Royalties"! Thanks for the kind words. Actually, Barnard's the audiobook author lined up for next week if all goes well. Death on the High C's is the most probable starting point... such a delightful title!